Despite the proliferation of digital marketing across all business sectors, banner printing still remains a useful and viable means of reaching out to your target audience. And, when it comes to choosing the material for these banners, fabric can be a great option. The use of fabric banners, either indoors or outdoors, adds an aura of warmth and softness to the presentation of your brand, say experts at Print Banners, a leading provider of high-quality fabric banners. Here’s a look at the benefits of using fabric for banners and banner stands. Fabric can be folded for easy storage and portability. If you have a six-foot banner, you don’t need to end up attempting to transport or store a six-foot tall roll, which would be the case with other materials. So, you get to save on space and transportation costs, while shipping them is easy too, in a regular sized box. Vinyl is widely used for its durability and weather resistant properties. But vinyl banners are prone to creasing and wrinkles, due to the application of pressure. Custom fabric banners are made of materials like nylon, polyester, satin and other synthetic fibers, which are wrinkle-free and resistant to tearing and creasing. In case of creases or fold marks on the banner, it can be removed very easily by ironing. These properties make fabric an optimal choice for step and repeat and pop up banners. Vinyl is generally a plastic material with a reflective surface that leads to extra glare when a flash is used to click photographs, especially indoors. Fabric, on the other hand, absorbs light and helps in cleaner and natural photographs. This makes fabric the better choice for banner printing for book launches, fund raisers, trade shows and other events. The modern printing process of dye sublimation, used on custom fabric banners, provides a smooth and natural texture, with bright colors. This makes cloth banners the ideal choice for indoor use. 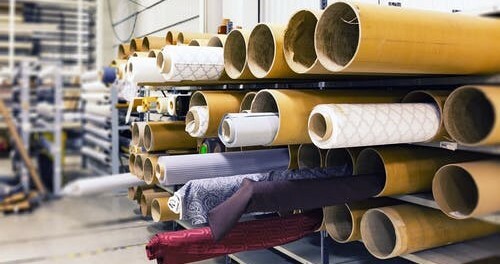 You can choose from a variety of fabrics, based on your need, without compromising with the quality of presentation. 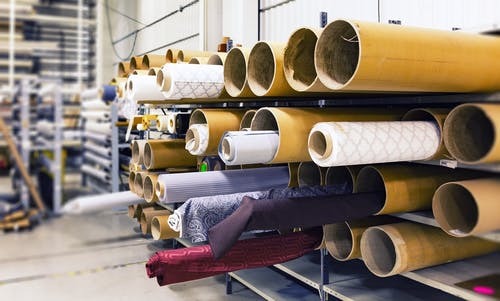 Fabric is lightweight and compact, making the process of printing and transportation easy. Despite being lightweight, fabric banners provide uncompromising durability and strength, even when used outdoors. Natural and synthetic fabrics are not only durable and strong but can be easily reused and recycled. This makes them cost effective and an attractive investment, if your business is going to use banners on a regular basis. The carbon footprint of custom fabric banners is 75% lower than that of other banners. Water-based inks are used for printing on such banners, which is less hazardous than solvent-based inks. If your firm is going to participate in a number of tradeshows, exhibitions and other events, you need a material that can fit anywhere and be installed with ease. Fabric signs can be created quickly and easily and fit in to your existing banner stands or other mounting hardware, saving money and storage space. If you want your banner to be attractive, with a modern look, while being easy to use and environment friendly, choose fabric without any further thought.